The camera, a Graflex made in 1913, doesn’t even fully work. A mentor gave it to photographer Joshua Paul in 1996 with the sentiment that he needed to “loosen up,” and Paul told Jalopnik he used the camera commercially for years. But his clients found its photos to be too “moody,” so, eventually, he just put it away. The 2016 F1 champion, Nico Rosberg, before he retired. It wasn’t until 2001 that Paul got the giant, leather-clad wooden camera back out. Paul said he got a call from a photo director on Sept. 12 of that year asking him to shoot the aftermath of the Sept. 11 terrorist attacks on the World Trade Center, and that’s when he got the idea to capture the scenes with the Graflex. Paul said he went to Ground Zero on assignment to catch the firefighters “emerging from the rubble of the World Trade Center,” which you can see a photo of to the left. But, after its work that day, the giant, mirrored camera again sat around—this time, for more than a decade. Paul, who started shooting professionally after college graduation in 1997, said he spent his first 10 years in the business working and traveling globally with different magazines. He photographed food, gardens, portraits and travel for years before meeting an automotive journalist while traveling on assignment. As Paul continued to get calls about Porsches, Ferraris, Aston Martins and the like, he started shooting the cars. 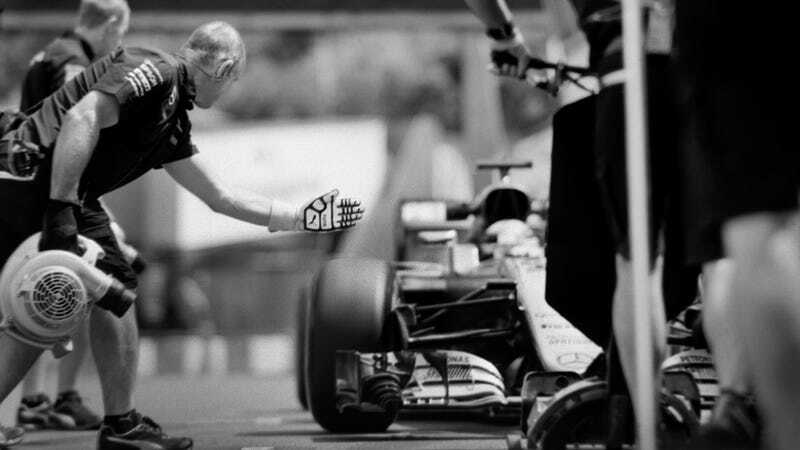 It was his second season photographing F1 when Paul decided to bring the old Graflex out—nearly 13 years after Sept. 11. Shooting the 2014 Monaco Grand Prix in period meant hauling all seven pounds of Paul’s Graflex around, holding it at the base with two hands and looking down into the camera to frame a shot. From the outside, it certainly doesn’t look easy—just check out Ferrari F1 driver Kimi Raikkonen giving it a try. “It’s all about trial and error, because the shutter speeds and apertures are so limited,” Paul said. “I just shoot a lot and hope all the stars are aligned. Paul said he equates photography to cooking, and that he’s “one who likes to pick his own vegetables, chop, sauté and braise.” He doesn’t see the process as difficult at all. “I really enjoy it, and I want to keep this medium alive,” Paul said. “I love the still image, love my old gear and I love the anticipation of shooting film, having to go to a lab and wait for a day to have it processed. Below are more photos from Paul, all shot on his 1913 Graflex.